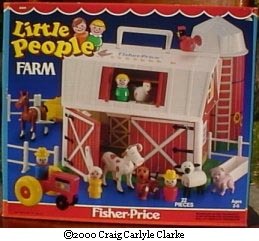 Description: The Little People Farm set replaced the long-running 1968-1985 #915 Play Family Farm. The #2501 is very similar to the #915, as it uses a similar barn, silo, and accessories. The "new" barn and silo roof now have a "ribbed" roof (vertical "beams") opposed to the #915's smooth roof, and the hay loft doors are now red, opposed to white. 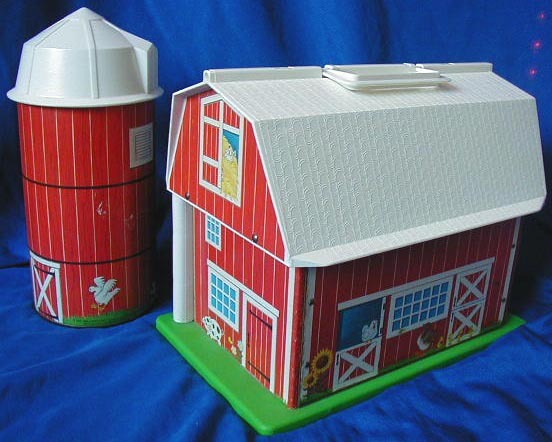 The barn has a green plastic base, and the door still makes the "moo" sound that everyone loves. The only accessory that is exclusive to this set is the little pink piggy. B2501A - Barn with a green plastic base and a ribbed (lines) white plastic roof with rounded corners. 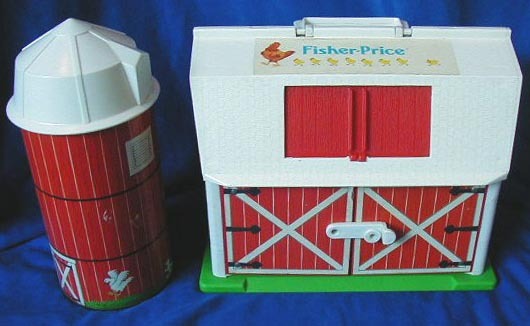 The barn walls have red paper lithos with white verticle lines, barn decorations, a Fisher-Price logo, and "2501". The front has 2 red barn doors with a white "X" on each door. The left-side door makes a cow-like "moo" sound when opened or closed. The barn has a hay loft with 2 small red plastic hayloft doors above the big barn doors. Measures 11" wide x 6-7/8" deep x 8-7/8" tall. *See "Variations" below. FPT933 - Silo - Round metal base cylinder with cardboard side covered by red printed litho. Litho has a RED FARM DOOR/SUNFLOWERS image on the sides. The litho also has a picture of a white dog chasing a flying chicken. Overall size: 4-3/8" diameter x 7-1/4" tall. FPT935 - Round white plastic pointed top lid that fits into a silo base and forms the "roof" of the silo. Lid has RIBBED sides. Overall size: 5" diameter x 3-1/2" tall. FPT468 - Orange/Red tractor with 2 large Yellow back wheels. Has a litho on the engine that has a black background, 3 dots (red, yellow, and blue), and 2 red lines above the dots. Front 2 wheels held on via ORANGE/RED plastic rivets and the wheels are NOT marked. FPT478 - Yellow cart with Red plastic axles, wheels NOT marked. FPT238 - 4 each - White plastic farmyard style fence section with a new style "WOODGRAIN" finish. The fence has two horizontal beams set across three vertical upright posts. FPT904 - White rectangular feed/watering trough with an open top. The trough is for thirtsy barn animals. Measures 4-1/8" long, 1-3/8" wide, 1" tall. FPT905 - White horse harness used to pull a cart. The harness has 2 long straight sides that are squared on the end. The squared end fits behind the horse tail and has a C-shaped hook to attach to a cart. The long straight side ends of the harness are connected with a small U-shape that fits over a horse's back. The bottom edge of the harness DOES NOT have a "scalloped" decorative look. Farm Animals: (Originally sold with all animals in one bag: FPT40,016 - WFL: 07-AA-00-6-G). WP - Bright white cow with brown spots, ears and tail. Has a smooth belly and the words "Made in Hong Kong". UP - Shiny dark brown horse with a black mane and tail, and black eyes with eyelashes. Has a smooth belly and the words "Made in Hong Kong". *See "Variations" below. WX - Shiny dark brown dog with white body spots, black facial features, black ears, and a black tail. Has a smooth belly and the words "Made in Hong Kong". *See "Variations" below. YU - Bright white sheep with black ears and legs. 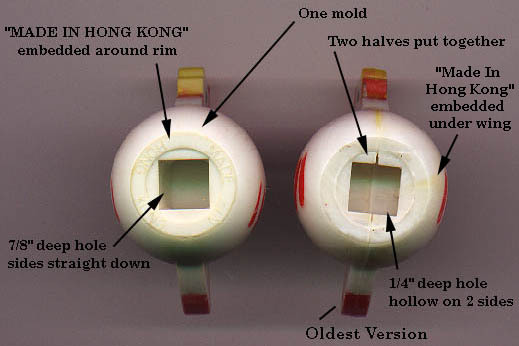 Has an indention in it's belly and the words "Made in Hong Kong". YN - Pink pig with pink ears and black dot eyes. 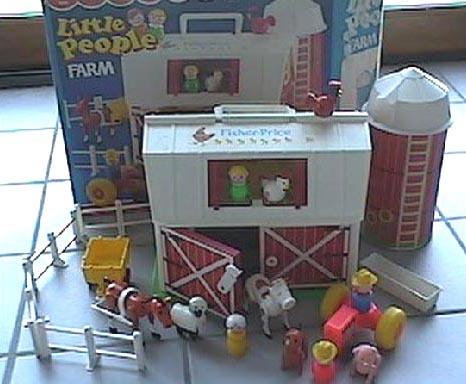 This is the first Little People pink pig made by Fisher-Price. Has a smooth belly and the words "Made in Hong Kong". WD - White chicken with a deep hold and "MADE IN HONG KONG" markings around the base rim. Click here for a photo. WF - Red Rooster with black heat-stamped feathers. This rooster has a deep hold and "MADE IN HONG KONG" markings around the base rim. Click here for a photo. ANPP - Tall blue farmer dad wearing a yellow cowboy hat and an orange non-triangular scarf. HEPP - Yellow mom with fancy eyes and white hair in a bun. JNPP - Light red boy wearing a yellow cowboy hat. FSPP - Green girl with a blonde sculpted bob. *See "Variations" below. 1990 - B2501B - In 1990 the farm roof has horse shoe designs molded into the plastic on the roof. FPT472 - a 1987 version of the tractor has yellow body with orange wheels. FPT482 - Red cart with Yellow plastic axles, wheels NOT marked. 1989 catalog - The horse harness appears to have been omitted. 1990 - The girl, dog, and trough were omitted. 1987-1990 - FP2501BOX1987 (Box ONLY) - This set was sold in a 15-1/2" long, 13-5/8" high, 7-3/8" deep box. 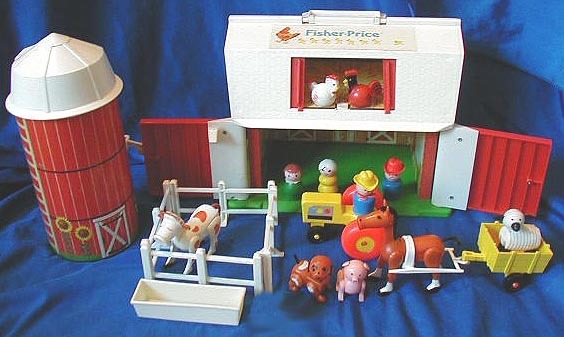 This is a reissue of the #915 Play Family Farm.